When a capacitor is connected in a DC circuit as in Fig 2.2.1, a large current will flow, but only for a short time. Electrons begin to flow from the negative battery terminal, and appear to be flowing around the circuit. Of course they can't because the capacitor has a layer of insulation between its plates, so electrons from the negative battery terminal crowd onto the right hand plate of the capacitor creating an increasingly strong negative charge. The very thin insulating (dielectric) layer between the plates is able to efficiently transfer this negative charge from the electrons, and this charge repels the same number of electrons from the left hand plate of the capacitor. These displaced electrons from the left hand plate are attracted towards the positive terminal of the battery, giving the impression of current flowing around the complete circuit. Fig 2.2.1 Charge and Discharge. After a short time however, a large number of electrons have gathered on the right hand plate of the capacitor, creating a growing negative charge, making it increasingly difficult for electrons flowing from the negative battery terminal to reach the capacitor plate because of the repulsion from the growing number of negative electrons gathered there. Eventually the repulsion from the electrons on the capacitor´s right hand plate is approximately equal to the force from the negative battery terminal and current ceases. 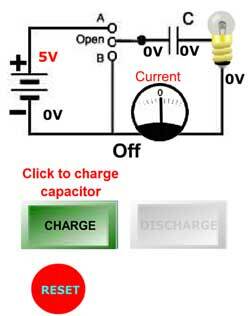 Once the battery and capacitor voltages are equal we can say that the capacitor has reached its maximum charge. If the battery is now disconnected by opening the switch, the capacitor will remain in a charged state, with a voltage equal to the battery voltage, and provided that no current flows, it should remain charged indefinitely. In practice a very small leakage current will flow across the dielectric, and the capacitor will eventually discharge. This process however can take seconds, hours, days, weeks or months, depending on individual circumstances. The charge on the capacitor will be depleted as the current flows. The rate at which the capacitor voltage reduces towards zero will depend on the amount of current flowing, and thus on the value of the resistance in the circuit, in Fig 2.2.1 this resistance is represented by the lamp. Using a lamp as a load resistance connected in series with the capacitor gives a useful indication of the operation of the circuit. Initially, as the capacitor begins to charge, the large current makes the lamp glow brightly. As the current reduces due to the build up of charge on the capacitor, the lamp dims and goes out once the capacitor is fully charged. When the switch is in position B and the charged capacitor begins to discharge, the lamp glows brightly once more, dimming and going out as the current falls towards zero due to the diminishing charge on the capacitor. Notice that during discharge, the current is flowing through the lamp in the opposite direction to the flow during the charging period.